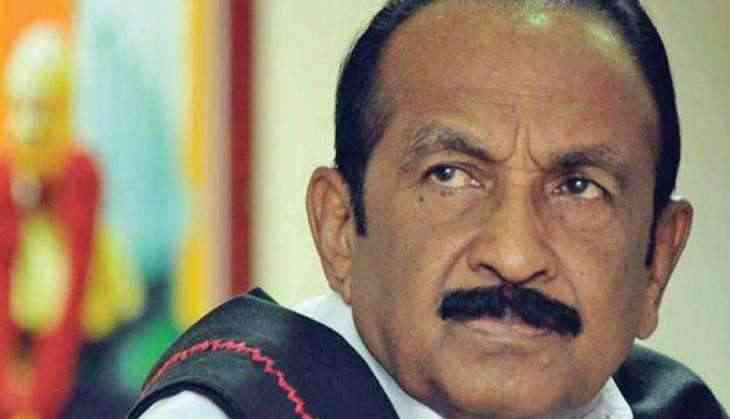 Senior Marumalarchi Dravida Munnetra Kazhagam (MDMK) leader V. Gopalsamy, also known as Vaiko, who was produced before a magistrate court in connection with a 2009 sedition case, has been sent to a 15-day judicial custody. Case under Sections 124-A and 153 were filed against the MDMK leader by the Tamil Nadu Police for his speech in which he had warned that India would remain a united single country if the war against banned outift Liberation Tigers of Tamil Ealam (LTTE) in Sri Lanka was not stopped. Vaiko has been a self-confessed supporter of LTTE chief Prabakaran and his idea of a separate homeland for Tamils and the Tamil Ealam. Prabakaran founded a militant group called Tamil New Tigers in 1972 and the LTTE in 1976 and waged a prolonged war against the Sri Lankan Army in the backdrop of the ethnic strife, involving majority Sinhalas and minority Tamils. He was killed in a military offensive in May, 2009. The LTTE, accused of assassinating former prime minister Rajiv Gandhi, has been outlawed in India since 1992. IPL 2019, KKR vs RR : कार्तिक बने रहेंगे कोलकाता के कप्तान या फिर होगा रहाणे जैसा हाल ?